Love the Circle and Label Thinlits dies! This week for Handstamped Sentiments Sketch challenge I created this card using the Circle Thinlits die with elements from the Label Thinlits. For this fun card I used a new Valentine’s color combo of Real Red, Pool Party, Melon Mambo and Daffodil Delight. It was a lot of fun creating this card using Stampin’ Up! items from my latest stash from the Occasions catalog. So many Stampin’ Up! products to play with with and so little time. The Circle thinlits die made it so easy to create this card. I started with a Whisper White card base of 5-7/8″ x 5-1/2″ then die cut using the Circle framelits die and the Big Shot. I used the Real Red from the Polka Dot Parade DSP on the right panel then just went crazy embellishing with hearts and such. I also used the Large Scallop Edgelits die to die cut the scallop edge in Real Red. The left side of the panel is stamped with the “Countless Sayings 1” Photopolymer Stamp set. If you haven’t tried Stampin’ Up!’s Photopolymer stamps, you’re in for a treat. The images are crisp and you can see precisely where you’re stamping. Also used was the heart from the Owl builder punch. The sentiment “love ya” is from the “Just Sayin’ stamp set and Thinlits bundle. I stamped the sentiment with Versamark and embossed with White embossing powder. The “i love u’ is from the Label Card Thinlits die set. 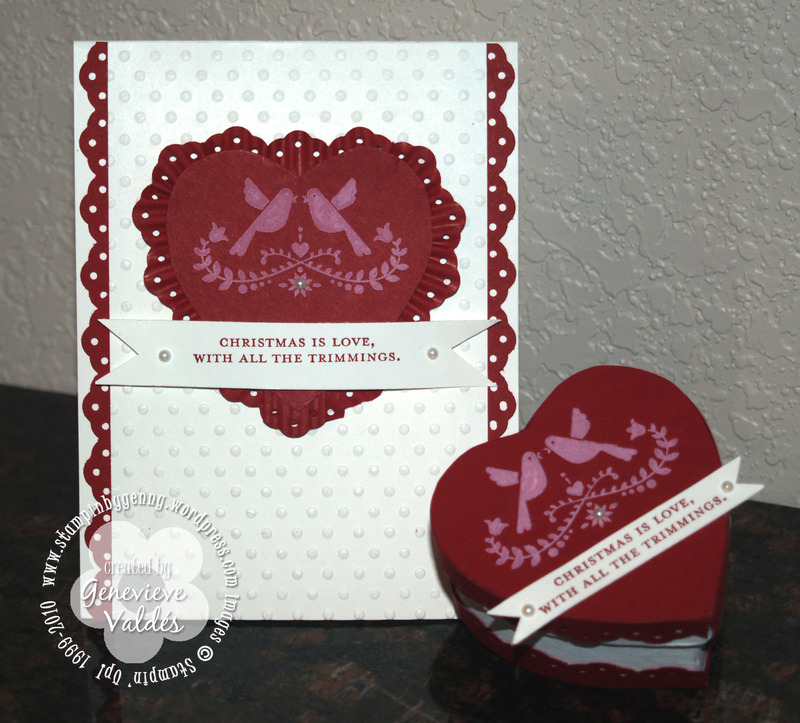 Also used was the scallop heart die from ” Hearts a Flutter” framelits set and the Small heart punch. To finish the card I used lots basic rhinestones. Join us at Hand Stamped Sentiments and show us your interpretation of this sketch. For this next Hand Stamped Sentiments challenge we have an inspiration challenge. See the bird photo below and see what your inspired to create. I created a Valentine’s day card with the Owl builder punch. 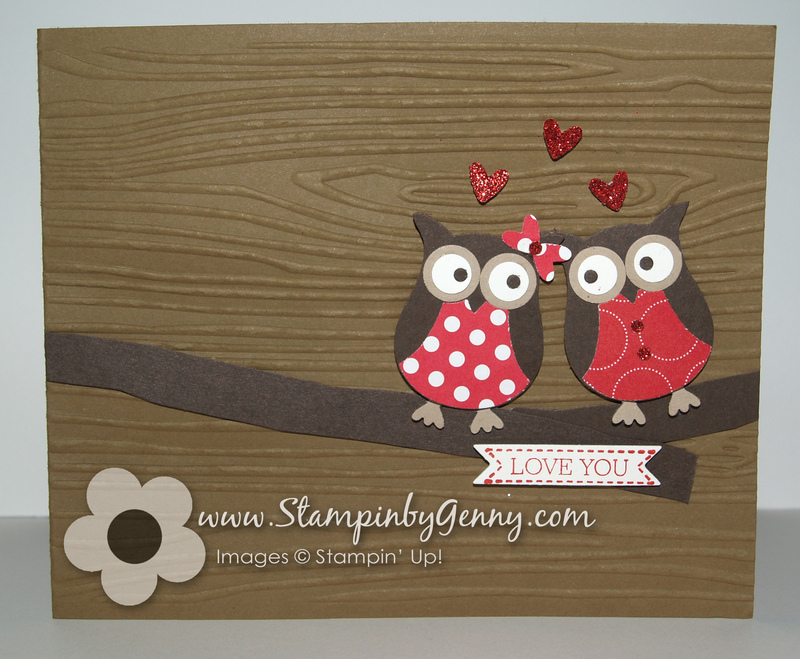 The punch was an easy way to create the owls on this card. Don’t these owls look in love? For texture I also used the Wood Grain embossing folder for the background. 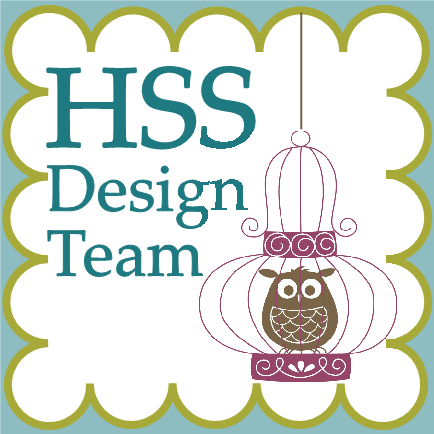 Join us at Hand Stamped Sentiments for more inspiration from our talented designers. This week’s challenge at Hand Stamped Sentiments is so much fun! The challenge is to be inspired to create a 3D gift project from a card. I created a card with the Northern Hearts hostess stamp set from Stampin’ Up! This stamp set is so versatile. It’s a Christmas stamp set but can be used for Valentine’s or a birthday. I love it! This stamp set can only be earned with a minimum workshop of $150. Email me to book your workshop so you can earn this stamp set. With Christmas around the corner I decided to create a Christmas gift set. I created the card using the bird image in a heart then thought about putting it together with a heart box. The heart box is perfect for a small gift. I purchased the heart box from a craft store and painted it with white acrylic paint. I traced the lid on Cherry Cobbler card stock, cut it out and stamped the bird image in craft Whisper White then adhered it to the top of the lid. I stamped the image with Cherry Cobbler ink on Whisper White card stock then cut it out banner style. I also added small half pearls, and used the Eyelet border punch for trimming and the Perfect Polka dots embossing folder to give my project that extra touch. The sentiment is from the Contempo Christmas stamp set which is perfect. I hope you’re inspired to participate in this fun challenge. This week over at Hand Stamped Sentiments we have a color splash challenge – Whisper White, Rose Red, Old Olive, Chocolate Chip and Crumb Cake. Some of the designers this week must have had Paris in mind because we reached for the Artistic Etchings and Chic Boutique stamp sets. I used the Chic Boutique stamp set because I recently purchased it and I had not had a chance to use yet and Paris is a place I’d love to visit. I had a lot of fun creating this card. BlOG CANDY WINNER: The winner for last week’s challenge selected by RANDOM.ORG is #6 Christiana of Christy Gets Crafty who wrote “How lovely and inventive! You did a great job with this card! I’ve never seen anything like it.” Congratulations to Christiana and thank you all for your comments. I also hope to see you participate in this week’s color challenge. To add more dimension to the background texture I also sponged it with Chocolate Chip. I stamped the scroll frame with Gold Encore ink and heat embossed it with clear embossing powder. 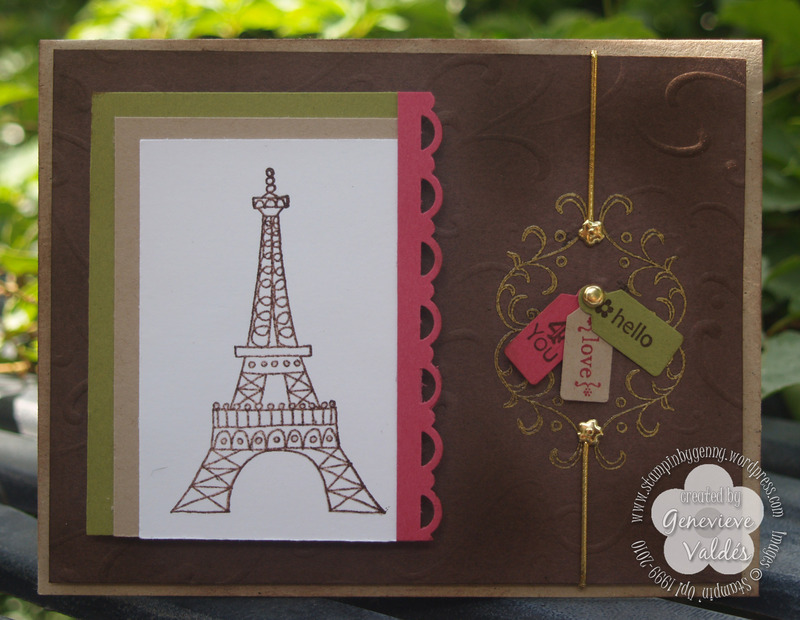 The Eiffel Tower is stamped with Versamark and Chocolate Chip and heat embossed with clear embossing powder.